This 5 Person Toilet Bucket Survival Kit is designed to sustain five people for 3 days (72 hours) in the event of a disaster or emergency. A great kit for home, office or travel, this 5 Person 72 Hour BUCKET BUDDY Survival Kit is ready to go at a moment's notice. 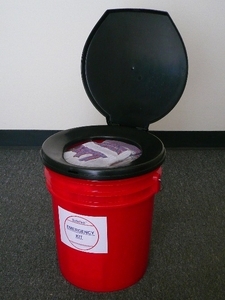 Packed in a 5 gallon plastic bucket this Emergency Kit can be turned into a portable toilet. Survival Food and Emergency Water are US Coast Guard approved and come with a 5 year shelf life from date of manufacturing.